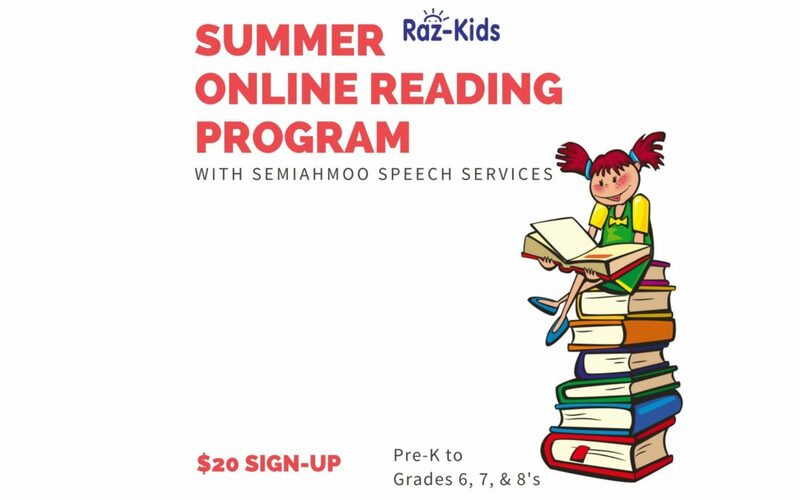 This summer, Semiahmoo Speech Services is very excited to offer families with children ages Pre-K to Grade 8 an online reading program through raz-kids.com, an award-winning reading resource! Help your child improve their reading and literacy skills anytime,anywhere! With a huge wealth of interactive e-books at their fingertips, kids can work through 29 different levels of reading difficulty with verified text complexity and guaranteed quality content. Kids will be able to read at their own pace and record their own reading to practice and demonstrate fluency. They will also be given a comprehension quiz so that their understanding of the content can be monitored by a registered Speech-Language Pathologist. Semiahmoo Speech Services is passionate about supporting the love of literacy throughout the community and to help all kids improve or keep up with their reading skills! This is why we will be offering this fantastic program for $20 per child– we hope to make literacy and books accessible to everyone. You will also have the option of contacting us remotely, meaning that this program can be administered without a single clinic visit! We would be more than happy to set up a program for you and guide you through the steps to get it up and running at home. Keep your kids engaged and critically thinking throughout these next summer months!